When it comes to my sewing and baking, I'm often asked, 'when do you find the time?' I've been thinking about how I manage the amount of crafting that I do, and started to really formulate my crafting strategy after reading a post about how to follow the Sew Weekly challenges online. In case you aren't familiar with the Sew Weekly, it's an online community where 'challengers' attempt to make one completed garment a week, for an entire year. I participated in a few of the challenges sporadically in 2011, but I really want to make an honest effort to keep up with it in 2012. This has forced me to really plan out my sewing and figure out how to fit it all in. I store my project length fabrics on bolts - free from your local fabric shop. Just ask if they have any empty ones available. This helps me organize my space so I can find everything faster, and I attach a piece of paper with yardage details to each bit of fabric. Just baste something in place if I want to test the fit out. Then try it on myself or my mannequin 'Emmy' (get it? From the movie? Ok, nevermind). If I see fit issues, then I'll take out the basting, otherwise I then sew it properly into place. But really, I live by Emmy. If you can, pick up a dress form. I purchased mine on sale at JoAnne's. If you sign up for their mailing list, they'll send you coupons, and they will let you know if there are special discounts on things like dress forms. You can also make your own - there are a few tutorials floating around blogs about how to do one that is your exact shape. I considered doing that before I picked Emmy up. I liked her because I could adjust her size and add padding to specific areas that needed it. 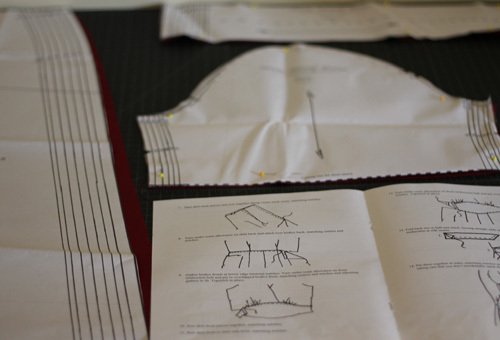 Laying out my pattern pieces and reviewing the instructions ahead of time, so I save time during assembly. I also try to get everything together for each project so I'm not scrambling around finding everything. It's like my sewing 'mise en place.' I have all the notions, threads etc, already setup. I think Colette had done an article saying to fill at least two bobbins at the start of a project to save time. That totally works for me. I also try to do similar things at once. If I have the pattern pieces and the instructions want me to only do one set of darts, unless I see elsewhere in the pattern reason to do it later, I will do all darts at once. I hate doing darts so it gets it out of the way. Two birds, one stone. Two projects ready to go! All notions, interfacing, patterns, and fabrics are kept together when possible. Veronica Darling also called out another method I follow too often. When hand stitching is needed, can I top-stitch instead? I personally don't have an issue with the look of top-stitching, so if a pattern recommends hand-stitching, I try to avoid it whenever possible. And finally, I watch a lot of tv while I'm sewing. My husband has an extensive dvd collection that includes many of our favorite tv series/movies, and we get Netflix. So over the course of sewing, I can watch and entire season of Buffy, or watch a couple of movies. Whatever I'm in the mood for. It's usually shows or movies that I've seen so I don't have to worry about sewing over my finger or spending too much time watching, but it gives me a break when I get frustrated, and is just nice to have going in the background. Speaking of which, I'm going to start listing out what I watched while I created a garment. This is generally how I measure how much time it takes me to complete an item, though sometimes this number can be off... Particularly if I get engrossed in the movie and taking a lot of sewing breaks. 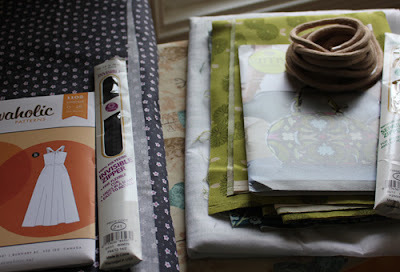 In addition to all of this, I try to set aside time at least a couple nights a week to go into the sewing 'zone.' I pick out my movies, think about what I want to make - sometimes pacing the room holding up different fabric to different patterns, etc, make sure that I have everything I need to make it (or make a shopping list if I'm missing any notions) - and get to it! This is usually time at the end of my day. After work, dinner, dance classes, family time, etc is done. Sometimes I do this in the middle of the weekend, but I usually find that time flies way too fast when I do that, and I can end up eating up a whole day crafting. Not that it's bad, but I'd rather spend time crafting time confined to when I would otherwise be sitting on the couch channel surfing. 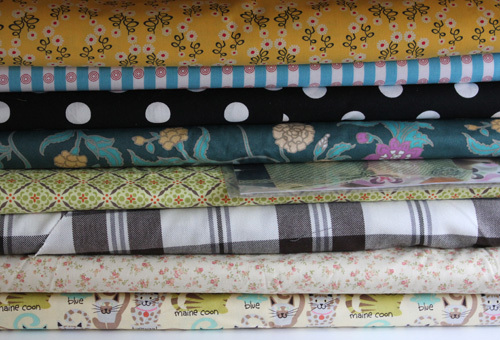 Tilly actually did a whole feature on her blog about Sewing Productivity. It's really useful stuff, including how to pre-plan your sewing, prepping projects, and getting into the right crafting mindset. What about you? What crafting tips and short-cuts do you have? I don't know that I have any great tips but I think in a way the commitment to sew weekly is helping me to plan ahead a bit better. I try to think of my ideas as soon as the challenge is posted. This gives me plenty of time to get things together. You are very organized! 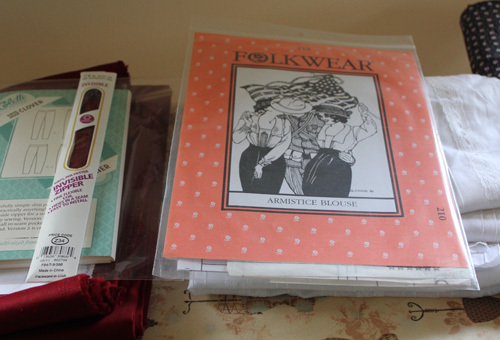 I need to get that way in order to be able to see what I have, fabric, yarn and scrapbook stuff. Thanks for the inspiration. 7) If happy with how it looks pinned. I sew by hand watching the tv. Usually mindless shows about antiques/singers etc. or I'll put on a film....at the moment its old hollywood musicals. Only using the machine if I really need to for speed or strength.